Resilience - "I will bend, but not break!" 1. The power or ability to return to the original form, position, after being bent, compressed, or stretched; elasticity. The day started out better than most. It was Saturday morning and a cool 64 degrees. 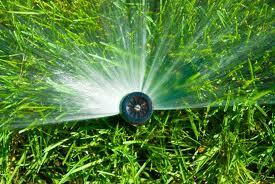 I stepped out the back door and turned the sprinklers on. I glanced skyward to the sound of about 15 Canadian “honkers”, flying in the standard V formation. The sky was blue, not a cloud in sight. Fall time at 5000 feet is a beautiful time of year. Out of the corner of my eye, I caught a glimpse of a reflection beyond the fence and noticed a pool of water that did not represent the amount of time that the sprinklers were on. It was under a hemlock and I had never seen the water pool up like that before. So, I stepped around the fence to get a better look. I couldn’t see very well from my current vantage point and decided that the only way to get a good look was to dash into the yard…yes, I would get wet! I turned the sprinklers off and went back over to where the water welled up out of the ground. This was quickly going from a good day to not so good. The water was coming out of the ground near the base of the 100 year old birch tree. The water meant that there was probably a broken pipe. The pipe was most likely cracked do to pressure from the roots of the birch tree. 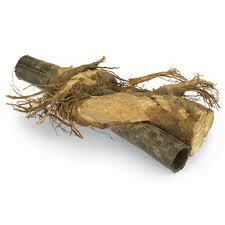 The pipe was a metal pipe and was not very resilient in the face of the constant pressure from the root. I knew I could fix the pipe, that wasn’t the problem. The problem was getting to the pipe. No doubt, I would be digging through roots…not only the birch tree roots, but the roots of the hemlock as well. I now had a day long project. I walked up to the garage and grabbed a shovel and a pick. As I turned to head back to the tree, Ryan my 17 yr old son stepped out the back door and met me in the driveway. We walked back to the muddy site and he stood there, surveying the situation. 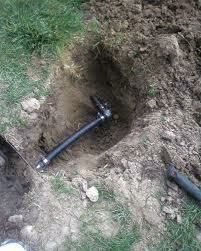 I explained that if we dig where the water is coming out of the ground, we may or may not find the pipe. The chances were pretty good that the pipe was broken somewhere else and the water was simply following the path of least resistance along a root somewhere until it gurgled through to the surface. I handed Ryan the pick and I took the shovel. We started digging. We eventually found the pipe, it took a few hours, but we found it. And, we were able to share an experience and work side by side, father and son. While this was one of those father/son “work in the yard” moments, it wasn’t the reason for this particular post. I’ve been thinking about this experience not in terms of father and son but in terms of water and roots. That pipe was put in the ground at least 50 years ago. Over time, the tree grew, life happened. The pressure associated with life started to affect the pipe. At first the pipe bent and dealt with the pressure just fine. As I dug deeper, it was apparent that this pipe was being pressured at many different points by many different roots. There were three or four large roots applying pressure, some over the top and others underneath. As Ryan and I worked to repair the pipe, we first had to cut away some of the roots. Some were small enough to pull away by hand. Others required the use of pruning shears and on a few of them we needed a small saw. How often do we find ourselves battling the pressure in life? For most of us it’s every day…life happens. The question then becomes, “How do we prune the roots of pressure in our lives so we bend, but don’t break?” The natural tendency is to ignore the problem. But, I can assure you that the broken pipe would not have fixed itself! Sometimes it may be small things we have to change. Other times, the course corrections in life are major. Sometimes it is important for us to make changes in ourselves. In other instances, we need to intervene in the life of a loved one. In either situation, it’s nice to have a close friend or family member there to share in the burden of inconvenience, provide some much needed feedback and lighten the work load a bit. While I could have accomplished all that was needed to fix the pipe by myself, it was nice to have my son there by my side. Great story and a powerful analogy! Really made me think about 'intervention'-sometimes we hang back too long in fear of interfering! Tech Addiction: Fact or Fiction?